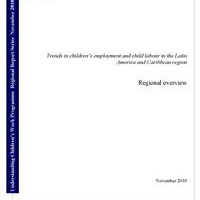 This Regional Report series provides regional perspectives on child labour, youth employment and related issues. The reports compare child labour and youth employment statistics across countries in a region, and help in identifying regional priorities for eliminating child labour and addressing deficits in decent work for youth. They are developed in conjunction with regional development bodies and the regional offices of the UCW partner agencies.